As we approach the end of another year let's remember that humanity is now subjected to yet another full year of spraying with metal particles. Not just humanity but all the poor creatures on earth are being sprayed, every plant and every tree, the bees and birds, the soil and all the little creatures that live in it, even the fish and inhabitants of the sea are suffering as aluminum, sulfur, barium and other toxic metals pile on everywhere altering the pH of the soil, contaminating the water and attacking the very essence of life on earth. Yes, chemtrails spraying is this big a deal and as another year goes by the globalist and their military industrial complex marches forward with their insanity to control the weather, deliberately engineering a much cooler planet by literally blocking our sunlight, and dumping enough toxic metals all over the planet to explain the destruction and slow death of many crops (ie food supply), all to the benefit of companies like Monsanto and the U.S. government. 1. Often we see ordinary planes who are not spraying, flying in the same air space and altitude as those who are spraying leaving long trails. 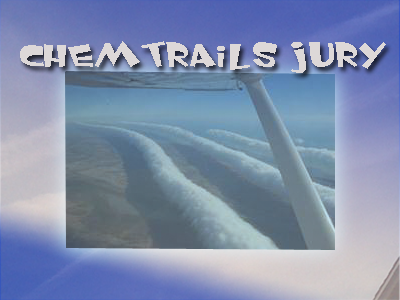 Given that "contrails" are dependent predominantly on the temperature and humidity of the surrounding atmosphere at that particular atmospheric pressure (which is measurable), and given that changes don't occur very quickly in nearby airspaces this should offer no less than a head scratch for anyone with an understanding of the issue and willing to apply science, reason and common sense. A. Admitting that spraying is real, it's necessary, cheap, important, developing and well planned, all in an effort to save the planet. B. Simultaneously the government and in particular its politicians and media and (Hollywood) TV mouthpieces have made a collective decision to DENY chemtrails spraying 9/11 style. Amazingly, when the issue is brought up to the general public it is said to not be happening and it's all a "conspiracy". The unmarked planes is a reminder of their commitment to operating in a clandestine manner while simultaneously advancing their plans and quietly conditioning the scholastic types that these are indeed legitimate programs to save the earth. 3. Planes that are spraying almost always fly with transponders off. One can verify flight data information by logging on to a site like flightaware.com and look for the plane when it flies over. Rarely if ever, will you see the plane show up on the website flight listing because it is not sending out signals. This speaks again to their commitment to secrecy and denial. 4. Spraying planes seem to fly in senseless patterns. They often fly in directions not commonly known for commercial flight including making U-turns and sharp turns. 5. Easily verifiable money-making weather modification and atmosphere-manipulating patents are available for anyone to review. These are not conspiracies or secret rumors, these are real patents. These patents are in use or they wouldn't exist. very high humidity. This disjointed pattern with nature's temperature and humidity is a stark contrast to what government geoengineers claim is the nature of contrails. All supposed government "contrails" studies show that "contrails" will only form under certain specific temperatures and humidity in accordance to the rules of nature. In other words, according to the rules of nature there are set temperatures and humidities that guarantee no contrails. These temperatures and humidities unfortunately never translate over to reality when one applies the Environmental Lapse Rate (ELR) formula to the known current temperature on the ground to calculate the temperature at plane altitude level. 7. Jets that spray our skies can often be seen to stop their spraying suddenly then restart seconds later. Something characteristic of a deliberate shutting off or perhaps a pause to change chemical canister from which the chemicals are being drawn from. With contrails on the other hand we would expect a smooth steady continuation of the condensation trail being created by (supposedly) the ice crystals that (supposedly) form spontaneously from the combustion of ordinary jet fuel. This is not at all what we see when we look up. 8. Throughout the year anyone can easily predict when they chemtrails will stop. In regions with very steady climate as in Southern California, this prediction is based strictly on observation of their spraying schedule not on the temperature or humidity. Hot or cold, we will see spraying throughout the year, and we'll see the spraying (predictably) stop at specific times of the year. 9. We can observe weather patterns that are often inconsistent with the established weather forecast. The difference? The spraying of the sky. Often the forecast calls for sunshine and blue skies and we'll observe the planes ruin the sky leaving cloudy overcast skies instead. A sharp difference from the predicted weather. 10. There are known weather modification private companies who admit they manipulate the sky for the purposes of weather modification. This information is public, real and easily verifiable. 11. Attempt at cloud seeding, weather modification, engineered drought, rain making and other manipulation and geoengineering of our skies is admitted by government agents, educators, geoengineers and other entities all claiming it's for the purposes of "global warming" and planet cooling. This admission is nonetheless the proof these programs are ongoing. 12. Patents for specifically aluminum resistant seeds are secured by the USDA and promoted by Monsanto. A bizarre coincident if this is not related to spraying programs which also employ the spraying of aluminum in the sky which eventually falls back to the ground. 13. Photographs of our skies prior to 2000 show little to no lines in the sky. Everyone with a photos collection has this proof in their hands. 14. Where is the documentation of protestors protesting sky lines back in the 1990's? How about the 1980's, 70's, 60's, 50's etc? Where is the history of genuine writers (not government scientists), authors of books and activists writing about the problem of lines in the sky? Where are the photos of activists packing the streets protesting sky lines in the 1970's? Did no one care about the environment back then?? These images and activist literature don't exists because movements only occur to address things that are actually happening in that generation. Chemtrails and sky lines are actually happening now thus we NOW have a movement to address this serious issue. 15. Trolls and disinformation agents claim ordinary planes have always made persistent contrails when they combust fuel and these trails inevitably change our weather and global climate as a result and block our sunlight. These wild claims suggest that dating back to the Wright brothers invention of the first plane, the invention turned out to be a weapon of mass destruction. As bizarre as this sounds, this shifting of the blame for the destruction of our skies from today's U.S. government, U.S Air Force, the DOD and all its private contractors and accomplice allies to the Wright brothers is inescapably at the root of their argument. Also at the root of this argument is that blue skies were never the norm even in sunny southern California or Hawaii due to natural contrails formation. This bizarre argument of course is a psyop on those who are unaware of the issue and the younger generations who are now being conditioned to believe this statement is true and that massive weird feathery and smudgy looking clouds injected in the stratosphere and troposphere with chemical trails flown into them is normal. One thing we should all keep in mind about chemtrails/chembomb spraying is that the military owns this issue. Activists have as much chance of stopping the U.S. Military Industrial Complex as they do of stopping chemtrails. The battle we face is a very long one and de-funding the U.S. military in particular the U.S.A.F may be one option for stopping this. To stop chemtrails we'll need other countries and power figures to step in to help. The depth of brainwashing, TV and mainstream media hypnosis and conditioning that Americans are under makes this an even more concerning issue. All hands are needed on deck to push back against the U.S. Military Industrial Complex on this issue. I firmly believe chemtrails/chembombs spraying is by far the greatest challenge humanity faces and could very well seal its doom. Help spread awareness of this issue, don't give up and keep doing what you can to expose this issue. As I've stated many times, those of us who are alive now are firsthand eyewitnesses to this crime against humanity. We are that generation that people 200 years from now would love to interview regarding the legend of the blue skies which by then will be a fairytale. Future generations will not even know that there was a time when the sky was plain blue without any lines in the sky. They will be so conditioned to see the artificial manipulation of our skies they will not have a clue that blue skies were once the norm. Save your personal evidence for future generations. I urge everyone to store and preserve all your childhood photos of plain blue skies and keep them somewhere safe. Make copies of your old photos if possible, you have no idea how valuable these will be to someone in the future. As for us here and now, we cannot take on the Military Industrial Complex head on but we can strategize other steps for fighting back including filing lawsuits and writing letters at least if only for the sake of keeping a physical record of our protest recorded in government records. Also write about this crime in articles, blogs and books especially. This will leave a trail of literature for future generations to see. "To this day, no one has filmed an ordinary commercial (labeled) passenger jet spraying... It doesn't mean it hasn't happened or is not happening"